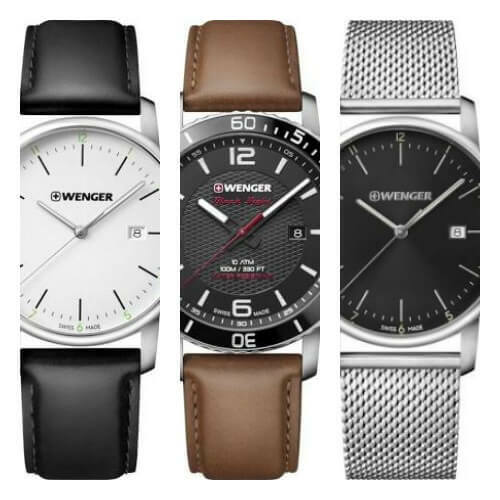 5 Best Wenger Watches Review – Are They Any Good? Hello everyone, today I’m going to be doing a Wenger watches review. I’ll be taking a look at the history of the brand, asking if Wenger watches are actually any good, followed by features just a small sample of 5 of their best watches currently available. Oddly enough the beginnings of Wenger watches starts out in cutlery. Founded in 1893 in the Delémont valley in the Canton of Jura, Switzerland, was the industrial cutlery house of Paul Boechat & Cie (what would later become Wenger). They received a contract from the Swiss Army to produce knives as the second industrial sized cutlery manufacturer of Switzerland. Paul Boechat & Cie was later purchased by a group of entrepreneurs, they decided to hire Theodore Wenger (a returning minister who had served in the USA) in 1897, this is where the name Wenger et Cie came from. One of the first things Wenger set out to do was acquire a manufacturer of spoons and forks which he decided to move to a rented factory in Delémont. Moving forward to 1908 the Swiss Army made the decision to split the contract, giving half of the order to the rival company Victorinox. Finally jumping all the way to 1988 Wenger started to produce quality Swiss made watches. But in 2005 the company was purchased by its competitor Victorinox. They decided to keep the brands separate using their own production and branding for the watches and Swiss army knives. To learn all about the history of Wenger watches check out their wiki here. So are Wenger watches actually any good? To qualify for the ‘Swiss made’ label that Wenger has their watches have to have a minimum of 50% Swiss components and be assembled in Switzerland. Wenger does make use of some imported parts to keep the prices of its Swiss watches lower, something seen in many brands. The use of quality Swiss movements means Wenger manages to ensure accurate timekeeping with its watches with durable and reliable mechanisms. They opt for high scratch resistance materials like specially hardened mineral or sapphire crystal glass depending if you’re looking at their affordable or higher end watches. 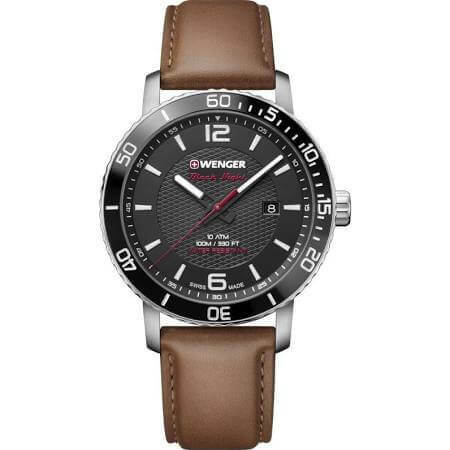 Wenger are another one of my favourite affordable Swiss watch brands along with Victorinox. Both of them are brands I’d happily recommend to someone looking for an Affordable yet reliable Swiss made timepiece. 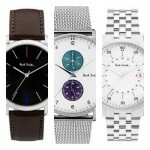 Below I’ve put together a little list of 5 of the most popular Wenger watches for men. This is just a small example to show you what’s available from this brand. Of course, I highly recommend checking out their full collections to find something that’s just right for you. If you have any questions about any of the Wenger watches featured below simply comment at the bottom and I’ll try and get back to you as soon as I can. For now, enjoy today’s list. 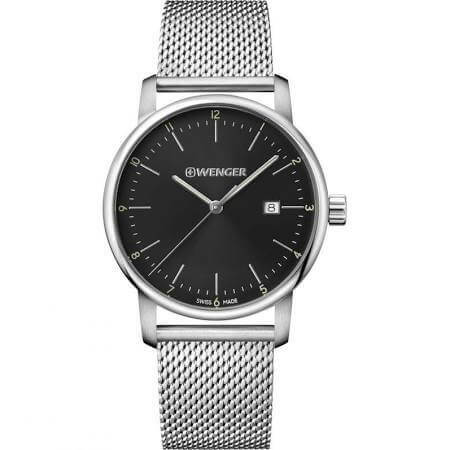 To get things started with our list of the top Wenger watches is this Urban Classic timepiece that’s a minimalistic watch with a clean and easy to read dial design. This model is built with a 42mm stainless steel casing that has a slim 9mm thickness. 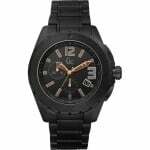 This best selling Wenger watch is powered by a Swiss quartz movement for very accurate and reliable timekeeping. The 100m water resistance rating on this Wenger watch is also great to see. You can read my full Wenger 011741109 review here soon. 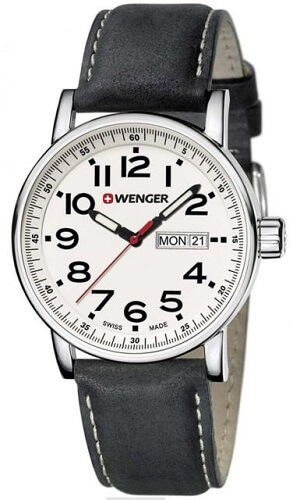 Next up on today’s list of popular Wenger watches is this ‘Attitude’ day date watch. This model features a very easy to read dial design with bold numeral style hour markers in black that stand out against the cream coloured background. The dial also makes use of a day and date display at the 3 o’clock position on the dial. The casing of this timepiece is made of stainless steel with a diameter of 39mm and a thickness of just 8mm making it another slim, men’s watch. At the heart of this Wenger watch is a quality Swiss quartz movement that provides reliable and accurate timekeeping. Just like the previous watch, this model also has a 100m water resistance rating. you can read my full Attitude Wenger watch review here soon. Here we have another one of Wenger’s most popular watches. This 45mm stainless steel timepiece is fitted with a comfortable genuine strap that fastens with a buckle style clasp. I’m a big fan of these types of textured dial designs on watches. They’ve also gone for another high visibility finish with contrasting hands and hour markers that stand out against this black background. This Swiss made watch is of course powered by a Swiss quartz movement to give you excellent timekeeping and reliability. The 100m water resistance is also an appreciated extra for the watch. You can read my full Roaster Black Night Wenger Quartz watches review here once it’s complete. 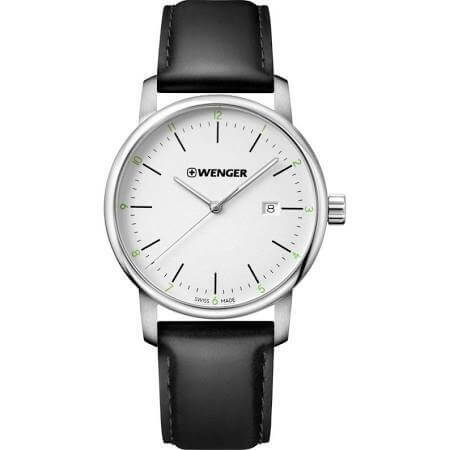 If you prefer classic dress watches then this next Wenger timepiece could be perfect for you. It’s a simple minimalistic timepiece with a 43mm stainless steel casing that has a slim 8mm depth. This has been paired up nicely with a simple black genuine leather strap. Powering this Wenger dress watch is a Swiss made quartz movement, this gives you accurate and reliable timekeeping. This model does only have a 30m water resistance rating so that’s worth keeping in mind before making a purchase. You can read my full City Classic Wenger watch review here soon. Today’s final Wenger watch to be featured is another model from the ‘Urban City’ range. A key feature of this timepiece is the stainless steel mesh strap. These are one my personal favourites as I find them comfortable and pretty easy to adjust. 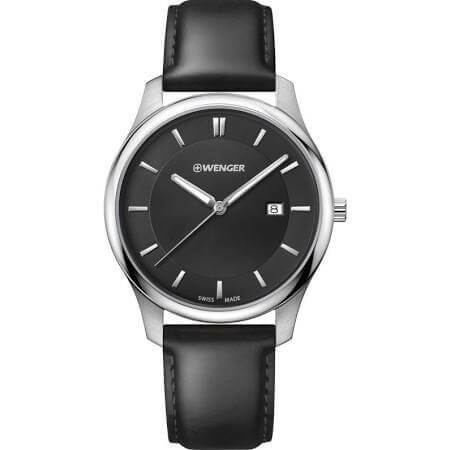 Like many of the Wenger range, this watch makes use of a minimalistic dial design with slim hands a thin hour markers. Just like all the watches featured before it, this Wenger watch makes good use of a Swiss quartz movement for accurate and reliable timekeeping. It also features a 100m water resistance rating which is something I’m happy to see. You can read my full Urban Classic Wenger watches review here soon. Thanks for taking the time to read through today’s Wenger watches review. My personal favourite has to be watch number 3, I like the standout casing design and the textured finish to the dial. What’s your favourite Wenger watch? Comment below and let us know. I just purchased a rather heavy and large Wenger watch as a present for my son, he’s always had a thing for those big face watches. It’s arrived already and I’m so pleased with it I’m considering getting a second for myself. Obviously I can’t go buying the same watch as him, he’d hate me for it. Now I need to pick another one that I equally like. Oh the struggle. Your Wenger watches review had me wondering how this brand would stack up against the likes of Victorinox watches? Could you do a comparison as overall they appear to be quite similar? I’d really like to know which watch brand is the better one to go for, Wenger vs Victrorinox? 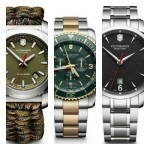 As a comparison of Swiss military watches that don’t break the bank.